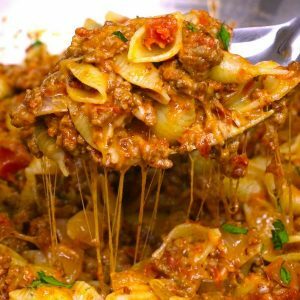 One Pot Cheesy Taco Pasta is the best comfort food: delicious taco flavors in a homemade meat sauce with shell pasta. And it’s ready in under 20 minutes for a quick and easy weeknight dinner that’s so much better than hamburger helper. Plus video tutorial! Taco pasta is one of our go-to weeknight dinner options, and it’s also a serious crowd-pleaser for a parties for game day or kids birthdays. 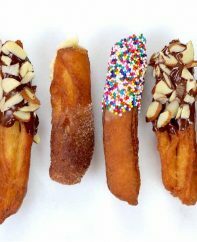 Best of all, it’s a foolproof recipe that’s quick to make. 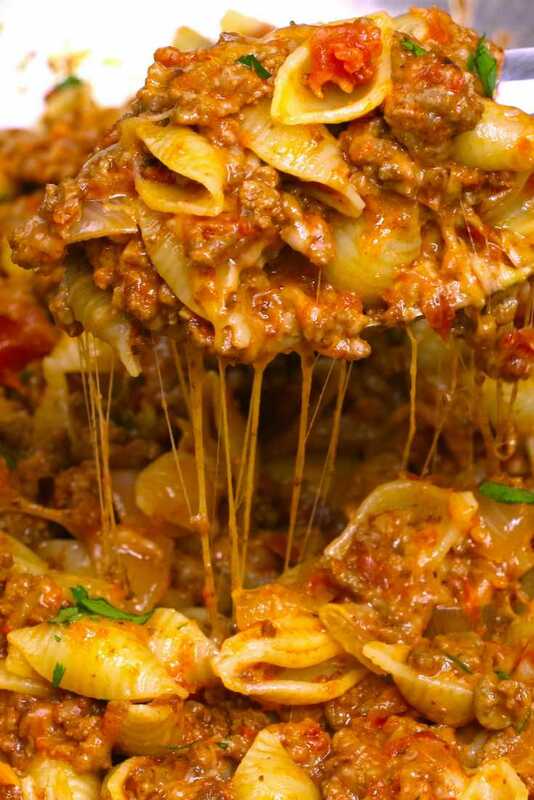 Don’t forget that taco pasta is basically homemade hamburger helper, those boxes of ground beef pasta. But why settle for packaged food when it’s so easy to make? 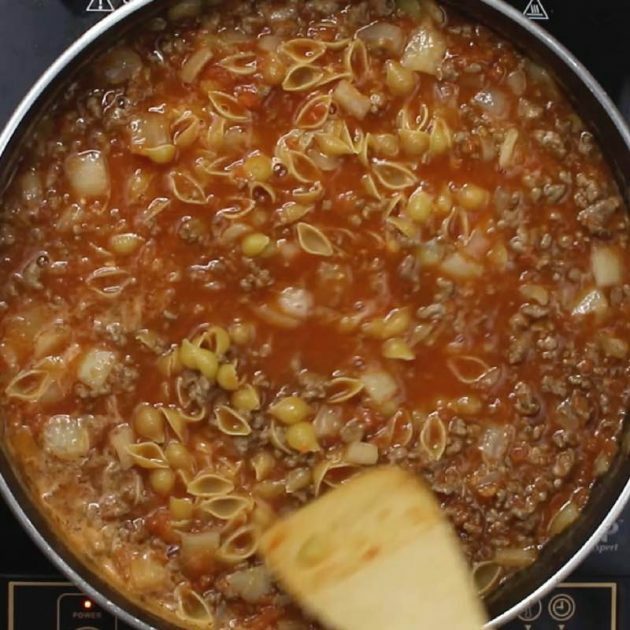 This cheesy taco pasta is a one pot recipe, meaning the pasta cooks together with the other ingredients. You can cook the pasta separately if you prefer, but it’s definitely easiest doing it all together. 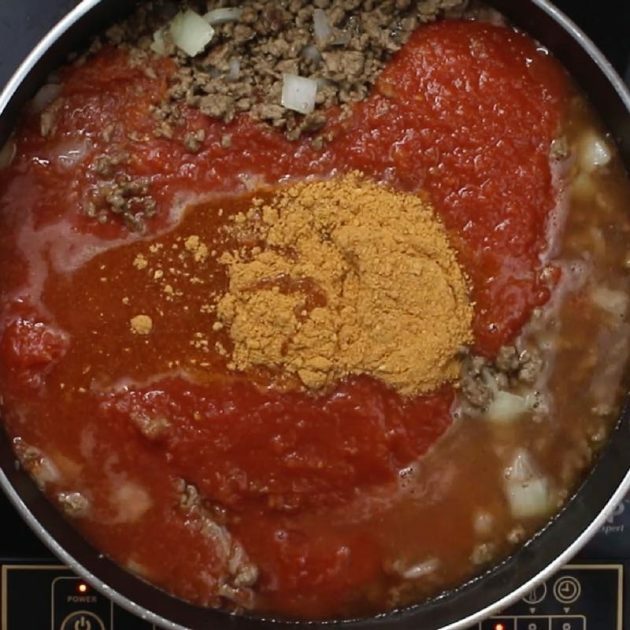 Once the beef has some color, add in the rest of the ingredients: tomato sauce, taco seasoning, water and pasta. The key ingredient is the taco seasoning, and it’s best to make your own homemade taco seasoning. If you prefer to buy taco seasoning at store, you can find it in packets or jars for larger quantities. It’s better to use lower sodium seasoning with mild flavor, and add more salt or spice as needed while cooking. Once everything is in the pan, just let it cook for 5-10 minutes until your pasta is al dente… When you’re ready to serve, remove from the heat and stir in cheese and optional cilantro. We like to serve it straight from the pan! If you want to make it in advance, it can be stored in the fridge for several days and the flavor even intensifies. Just be sure to reheat thoroughly. To make taco pasta healthier, use extra-lean ground beef, low sodium taco seasoning, reduced fat cheese and whole wheat pasta. 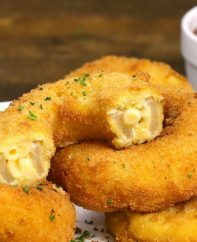 Even with these modifications, it’s still a super-delicious meal. 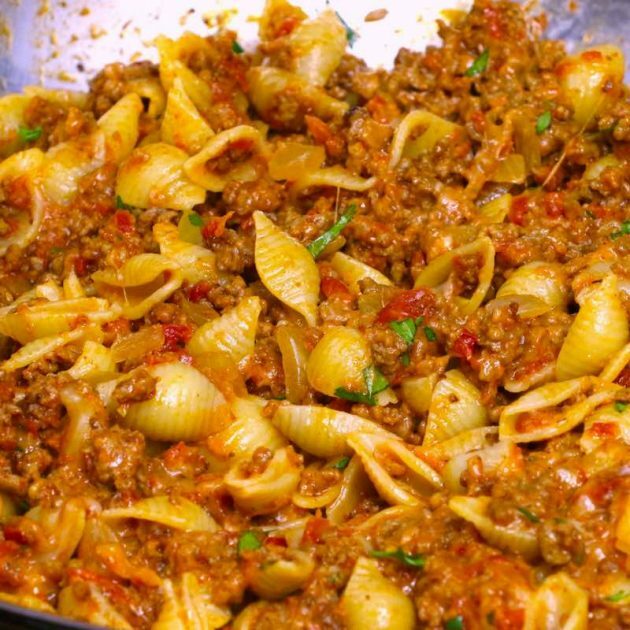 One Pot Cheesy Taco Pasta is the best comfort food: delicious taco flavors in a homemade meat sauce with shell pasta. And it's ready in under 20 minutes for a quick and easy weeknight dinner that's so much better than hamburger helper. Plus video tutorial! Place a large frying pan on medium-high heat. 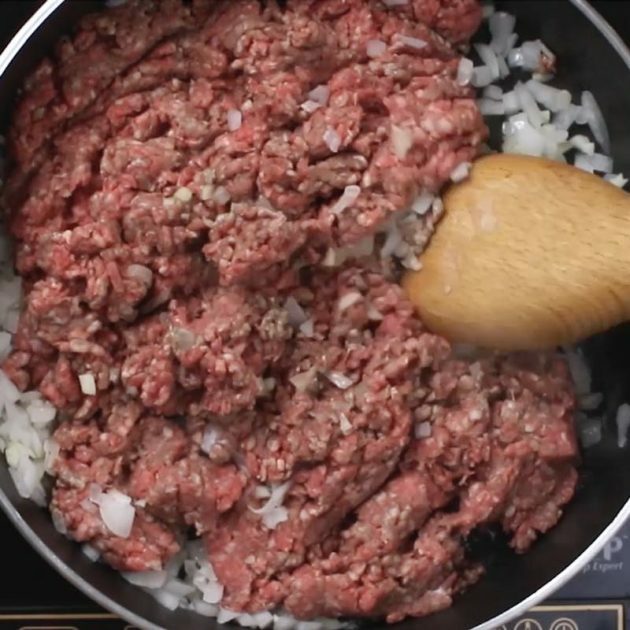 Add ground beef and stir until it is no longer pink. Drain fat from the pan. Add onions and optional garlic to the beef. Fry for 2-3 minutes until onions are translucent. Stir in the tomato sauce, taco seasoning, water and pasta. Loosely cover the pan, reduce heat to medium. Cook for 5-10 minutes until the pasta is done, stirring occasionally. Remove from heat and stir in cheese and optional fresh cilantro. Serve and enjoy! Looking for more taco recipes ideas? Soooo good! My family of picky eaters loved it! I left the cilantro for hubby and I. I had to add an extra cup of water and 8oz can of tomato sauce (El Pato) for more liquid to cook the shells. Turned out amazing. It was SO good!! I also had to add another cup of water and tomato sauce. I used the taco seasoning recipe tip and it was alittle spicy (which I like anyways). I didn’t have any shells so I used penne noodles. Didn’t have any left overs! It was very good but next time I’ll add more tomato sauce as it was a little dry. Otherwise, it’s definitely a keeper!! We loved it! Only wish I had read the comments before cooking. I ended up using an extra cup of water and sauce. I also added a bit more cheese. Delicious! Same! I wish I had read the comments about the water. I didn’t think it looked like enough, so I added an extra cup from the beginning, but I still ended u needing more. Everyone was happy with the meal, but I wish the recipe had been updated. Made this for our senior adult potluck tonight at church. Upped the meat to 1-1/2 lbs, the elbow macaroni to 4 cups, the tomato sauce to 2 8oz cans, and the water to 3-1/2 cups. Cooked it until almost done than turned it off and will reheat and add 6 oz shredded cheese just before serving. Made a lot, but it tastes great. Don’t mean to be redundant…just not clear on the amount of liquid to use. Is it 2 cups of water and 2 cups of tomato sauce that work best? Very delicious! Whole family loved it. Like everyone else, I added an extra cup of water. HOWEVER, I must point out it was not enough to feed a family of four, let alone 8 as stated in recipe! Myself and my teen had to settle for half a bowl, hubby had 2/3 of a bowl, and other teen had 3/4 of a bowl. Will definitely have to double the recipe next time for the family to be satisfied. I make this often, I add a can of Black Beans (rinsed & drained) and a can of corn (rinsed & drained). My family loves it topped with diced avocado, green onions, and sour cream. I make cheddar corn muffins to go with it. Would it be a tomato paste or a tomato sauce you use for pasta? I thought it would be a “friendly” version. However, the “video box” printed on the recipe causing 2 of the ingredients for the taco mix to print on a 2nd page. I have never had this happen before. Does the recipe for homemade taco seasoning make the 1/4 cup required for the recipe?or is it the amount you would get in a bought packet? If I could the pasta separately, do I still need to add 2 cups of water to the recipe? Or is that amount of water only needed if you could the pasta together with everything? What is a good side for this? Very good! Did rotesserie chicken, elbows and a can of fire roasted diced tomatoes because that’s what I had on hand. Added an extra cup of water. 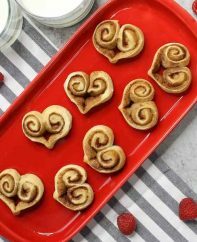 This recipe can be easily adapted to whatever is in the pantry. And a huge plus- I think my picky grandkid swill love it! Loved this! I used venison burger because that is what we have this time of year. Added extra water, substituted salsa for 1 can of tomato sauce, and added corn also. Big hit and made plenty for our family of 3 adults. Lots of ways you can change this up which is very nice.